We are a leading Manufacturer of material handling trolley and block shifting trolley from Coimbatore, India. As a leading manufacturer and supplier of Material Handling Trolley, we have achieved great laurels for our company. These are extensively sought after for their usefulness, high performance and durability standards. These material handling trolley are invaluable to transfer and shift construction material from one place to another effectively. These are designed as per the set industry norms and protocols and are made available to our customers at industry leading rates. We always assure that our products do not compromise on the quality aspect. 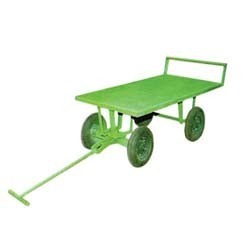 Our company has established itself as a leading manufacturer and supplier of superior quality Block Shifting Trolley in the market at the present scenario. These trolleys manufactured by us are appreciated in construction industry for high performance and durability standards. Leveraging on advanced design technology these trolleys are extensively used to carry and shift construction material from one place to another effectively. Our professionals perform multiple rounds of quality checks before delivering them to our customers and make them available at industry leading rates. Plunger to protect from ingress of dirt and dust.